Spot it! Which Are Grammatically Correct? Practice grammar skills with this helpful worksheet on editing and proofing. 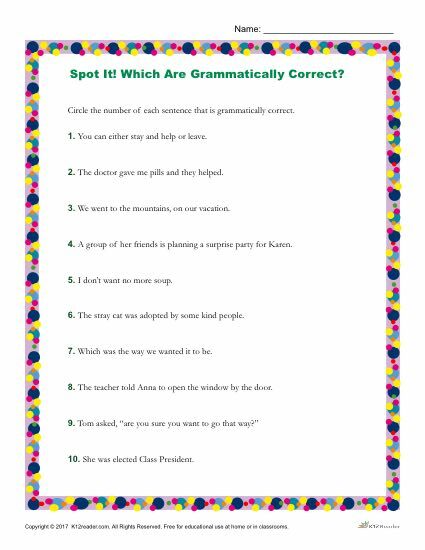 This grammar activity asks students to carefully read ten sentences and identify the sentences that are gramatically correct. For example, does the following sentence use grammar properly? You can either stay and help or leave. If so, the number of this sentence will be circled because it is gramatically correct. This printable worksheet on grammar is perfect for 6th – 12th grade students who are working to improve their reading, writing, proofing, or editing skills. To download and print the worksheet and answer key, click the link below.